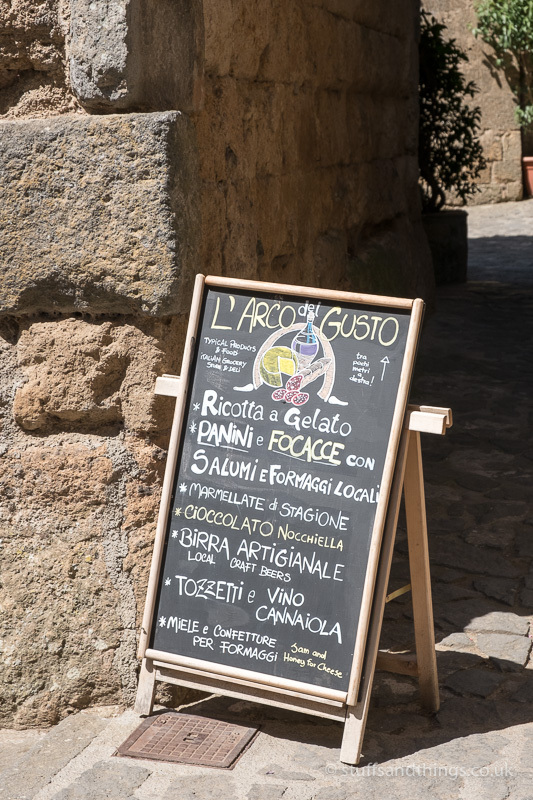 I was pleased to see it wasn’t too far from an area in Tuscany that I visit regularly. So on a recent visit to Italy, I decided to pay a visit and find out more about this magical place. Civita di Bagnoregio is a medieval settlement in Lazio, and was was originally founded by Etruscans over 2,500 years ago. Over the years, it has seen a lot of change, and has a long and varied history. 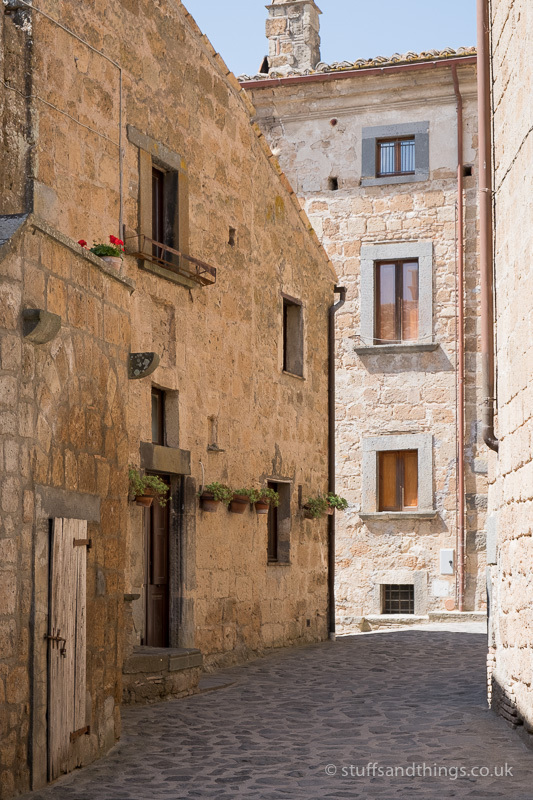 Built on chalky volcanic rock covering a clay base, the town perches on top of sheer cliffs overlooking the steep ridges and gullies of the local landscape. 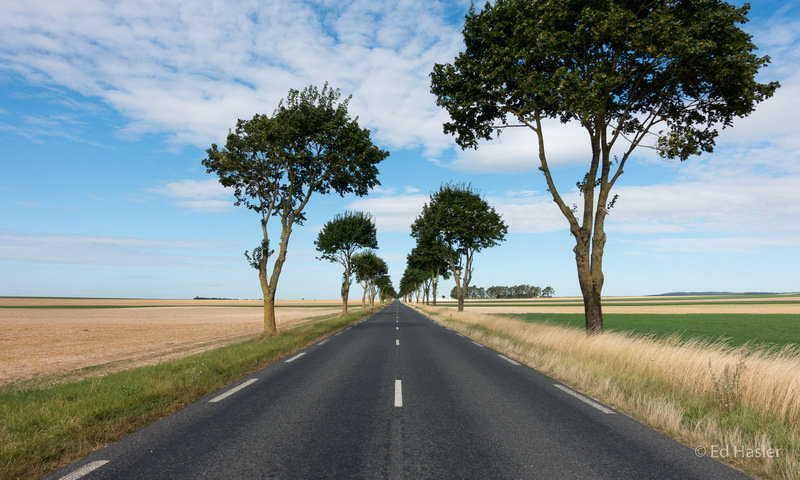 It is a small town – these days there are only around 10 permanent residents, although this number swells to 100 or so during the busy summer periods. The town wasn’t always this small though – back in the Middle Ages, it was twice the present size, and home to around 3,000 people. 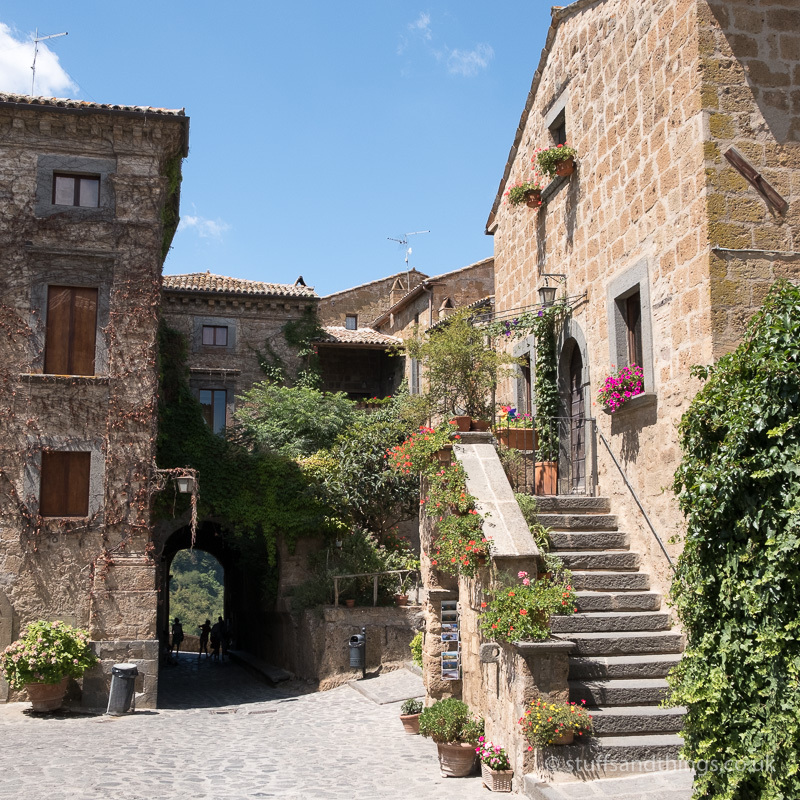 Italy has many hilltop towns and villages, but Civita di Bagnoregio takes this to the extreme. 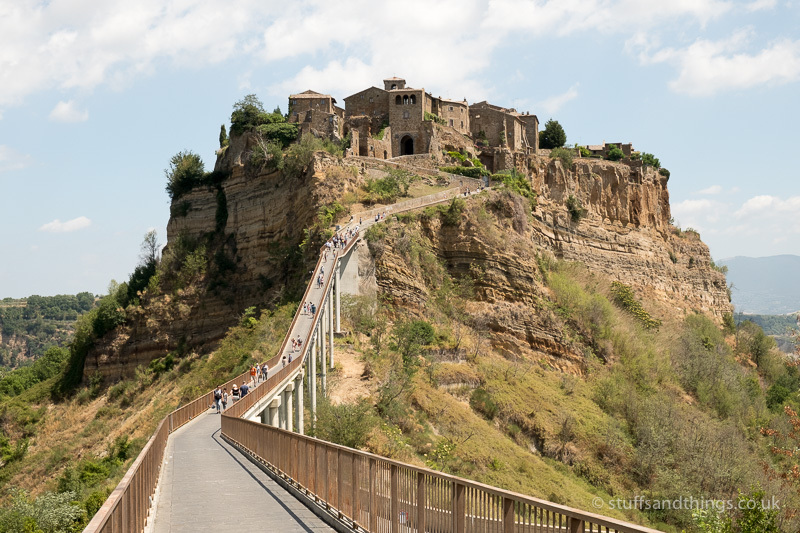 Unlike most other similar towns, Civita di Bagnoregio stands out in that it can only be reached by a narrow elevated footbridge. These days, it is a popular tourist destination, with over 500,000 visitors a year. It is also a candidate to be listed as a UNESCO World Heritage site. Over the centuries, the town has seen a lot of erosion, which has caused parts of it to collapse. Originally, it could be reached by a land bridge connecting it to nearby Bognoregio, however over the years this has gradually disappeared and an elevated footbridge is now the only way to access the town. The town has suffered from damaging landslides in the past, and not too long ago, it seemed that these landslides would lead to more and more damage. This explains Civita’s nickname “Il Paese Che Muore”, which translates to “The Town That Is Dying”. In recent years however, more work has been carried out to reinforce and protect the town to hopefully prevent more damage. 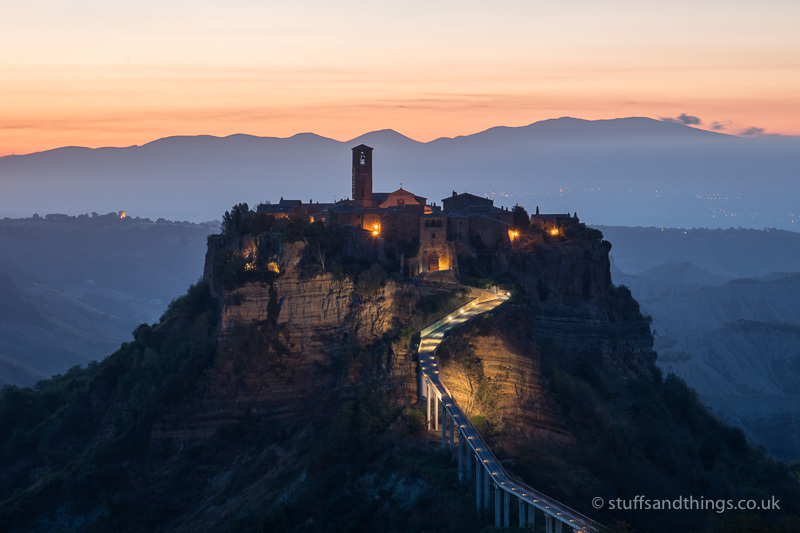 Civita di Bagnoregio is located almost exactly inbetween Siena and Rome – about 65 miles from each as the crow flies. I had driven down from Tuscany via Assisi, via some picturesque roads which passed by Lago di Cornara. It is also easily accessed via the SS2 road from Tuscany, which isn’t particularly fast but is an enjoyable route with beautiful scenery. 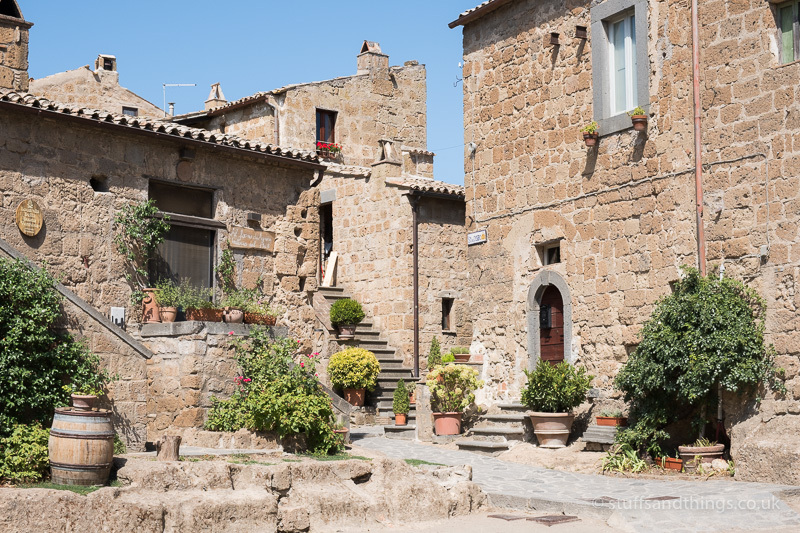 I had booked a hotel in the nearby town of Bolsena, located on the east shore of Lago di Bolsena. 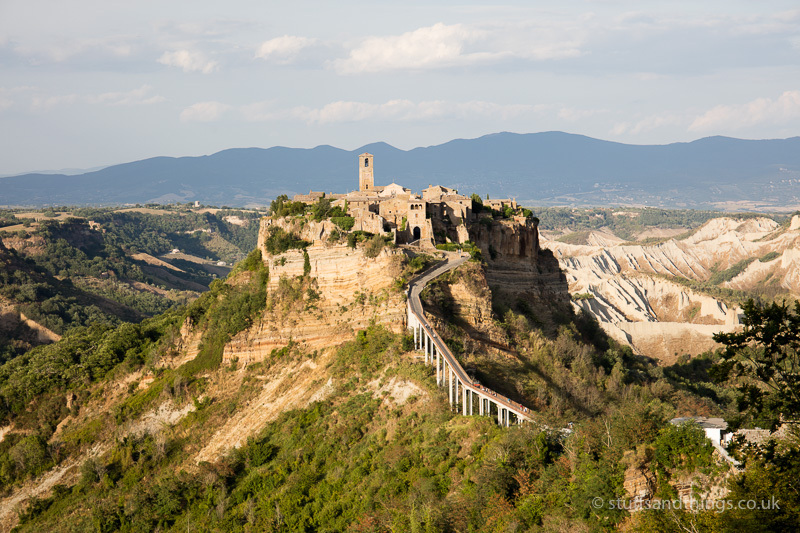 This was ideally located to visit Civita di Bagnoregio, which was just 20 minutes away by car. I wanted to take some photos of sunrise, and as I only had one morning I decided to stop off on my way to the hotel and scope out the location. When I’m taking photos, I like to research places first, so I know exactly where to go and don’t miss any shots because I’m still trying to find a good spot. 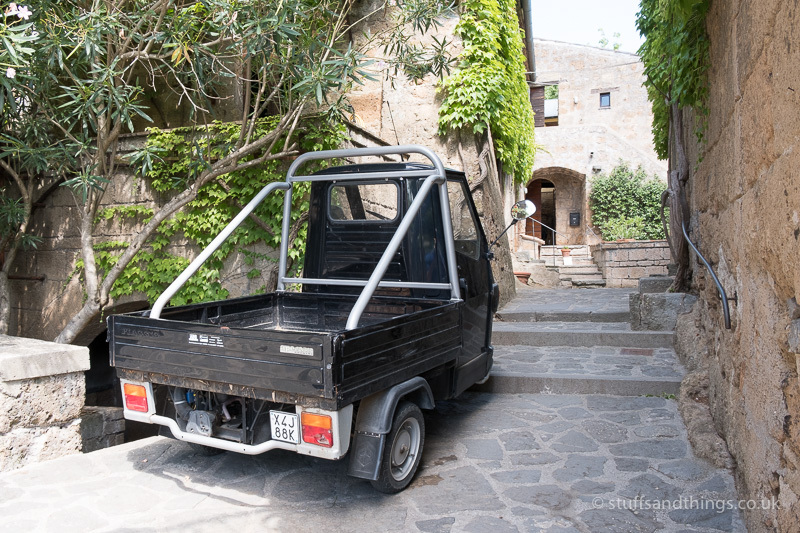 To get to the town, you have to drive through the centre of Bagnoregio, and basically head straight to the end of the road. There’s a traffic light which from what I could understand restricts access at particular times of the year, but when I visited it was always green. After passing through some narrow shop-lined streets, the road narrows further and as you approach the end there are a couple of car parks as well as on-street parking. I parked up, and took a short walk to a gate leading to a small garden area. I decided this would be my spot for the following morning, and took a few photos as the sun dropped. This viewpoint really shows how the town rises above the “Badlands” valley below. 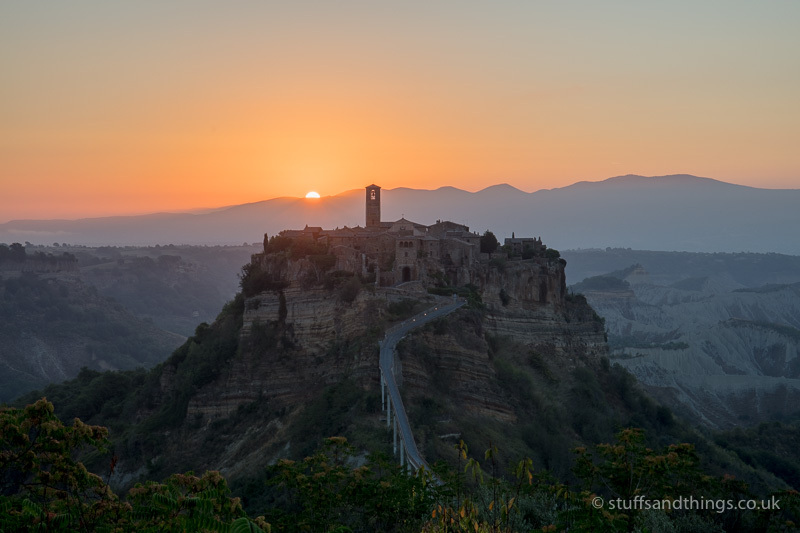 The following morning, I woke at 4.45am, and before long I was on the road heading back to Bagnoregio. Although it was dark as I left, I could see the sky becoming lighter as every minute passed. I was worried I was going to miss the best of the light, so willed the sun to slow down. Fortunately I arrived just in time, and managed to get some shots as the sun came up. It’s always a fantastic experience to watch the sun come up and see a new day begin, especially so somewhere as beautiful as here. It was incredibly peaceful, and I watched the sun rise over the distant hills with only the sound of my camera disturbing the silence. By this point, my stomach was rumbling, so I headed back to my hotel for breakfast. After a tasty breakfast at my hotel, I jumped back in my car, and headed to Civita for the third time in less than 12 hours! By the time I got back, the car parks nearest the bridge had filled up so I found a space on the street. Parking costs €2 per hour, and although I think the on-street parking was free for the dates I was there, I bought a ticket just in case. To get in, you can either walk through the small garden area (known as Belevedere) and walk down some stairs, or there is also a road you can take. After a short walk, you reach the walkway, however you will need to pay a small entrance fee. This is €1.50, plus an additional €6 if you want an audio guide. 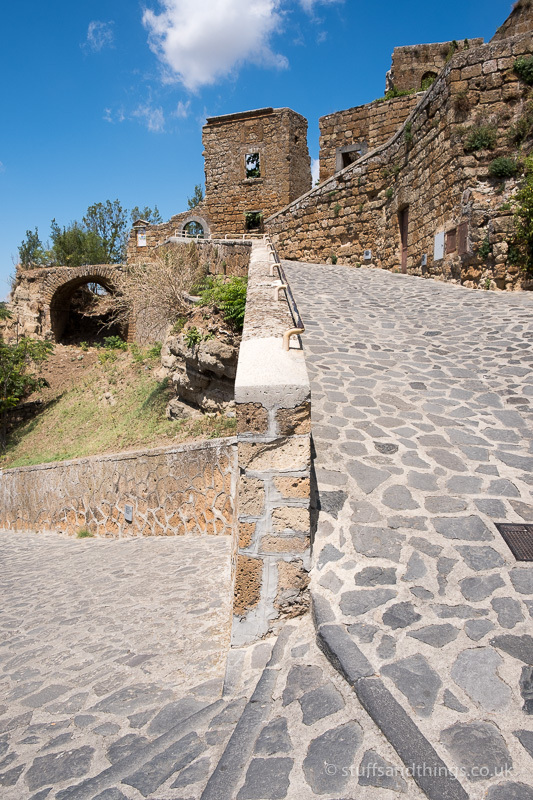 Walking up to the town is quite hard work – it’s uphill, and quite steep in places. You also need to watch out for the locals driving their small buggies along the bridge. Cars aren’t able to reach the town, so this is their only way of getting items in and out. As you enter the town, you pass underneath a stone archway, and there are some conveniently located benches. These are ideal if you need to have a quick rest and catch your breath after the long walk up! Once inside the town’s walls, it is like going back in time. There are no cars, as only small motorised buggies and motorcycles can reach it, so the streets are very peaceful. As you wander around, the silence is only broken by fellow tourists wandering around, and the locals going about their daily business. As you have probably noticed from the photos, it is not a large place, and it doesn’t take too long to get from one side to the other. However it’s very enjoyable to wander around the small medieval lanes slowly, taking it all in. As you pass through the main entrance square, you enter a small square with a cafe and small tourist shop. As you continue, you then reach the main square. 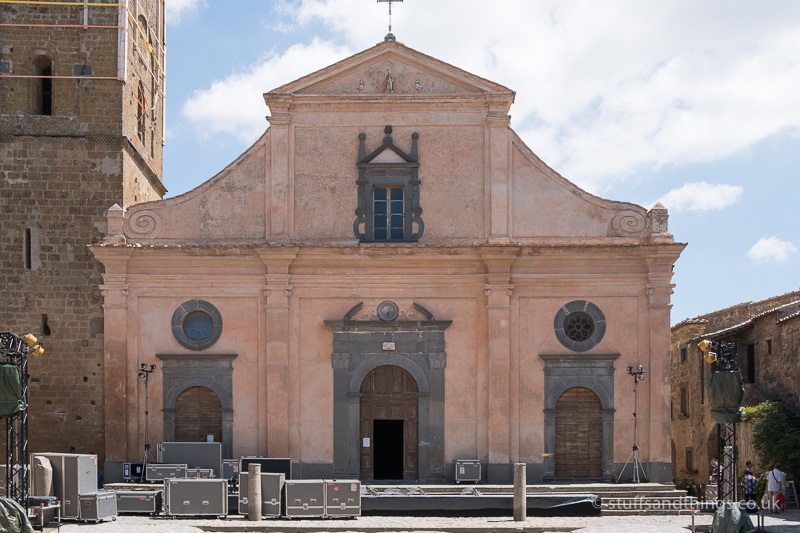 This is surrounded by stone houses, a bell tower and the 13th century San Donato church. 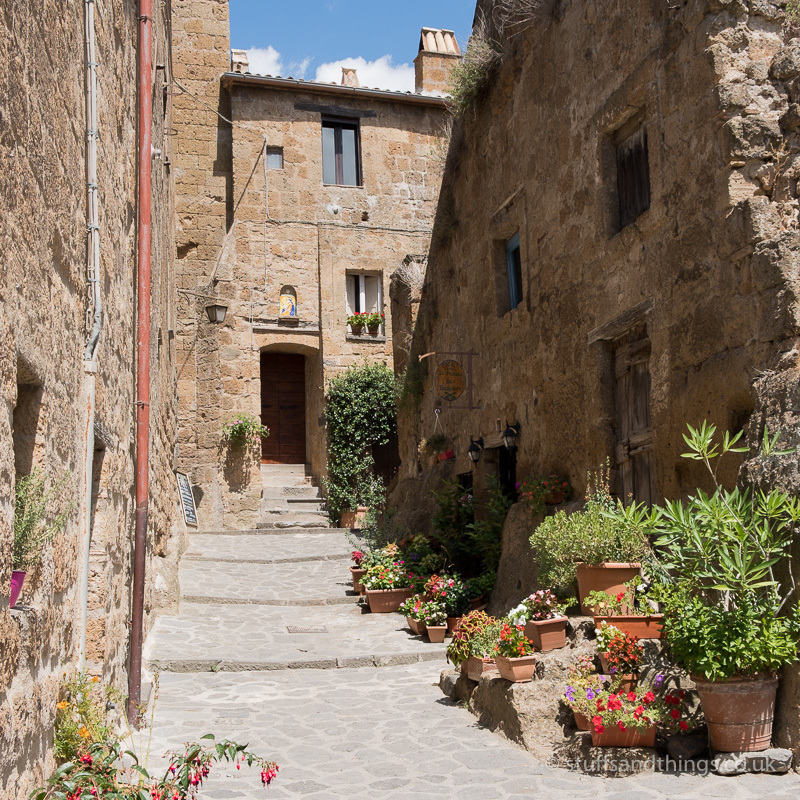 As you wander round the pretty streets, one thing that stands out is how well everything is maintained. I was there in the middle of summer, and there are well-kept flowers outside almost every building. 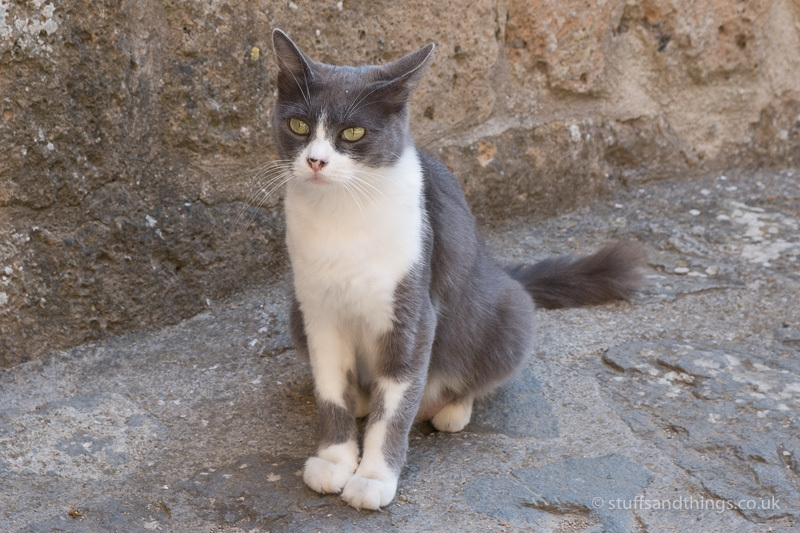 The town also has a number of feline residents, who enjoy wandering around the quiet streets, relaxing in the sun. If you’re in need of a rest or refreshing drink while wandering around, there are a number of small cafes you can visit. Some even sell local craft beers, although as I was driving I wasn’t able to sample these. It initially seems like you won’t need to spend much time here due to the small size, but it’s easy to be so absorbed in exploring the pretty streets that time just disappears. After a rather pleasant few hours of exploring and taking photos of this stunning town, I reluctantly big my farewells and headed back to my hotel. 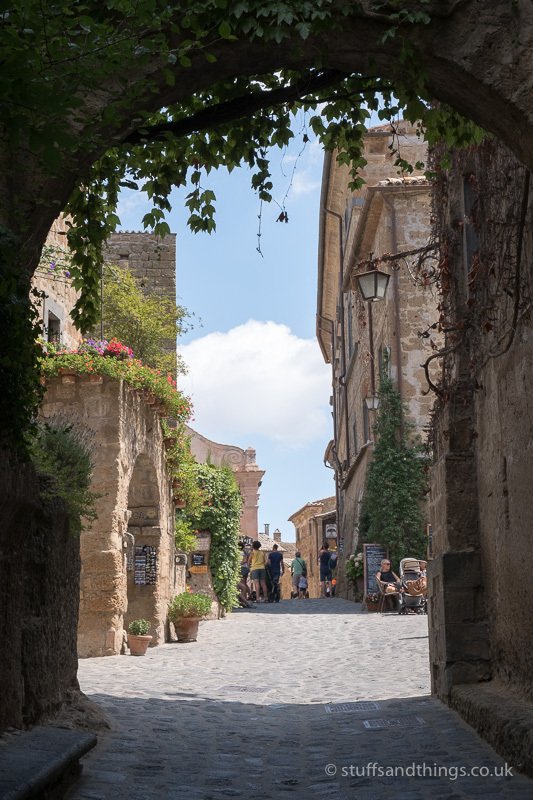 Civita di Bagnoregio may be small, but it is very special, and I’m glad I made the effort to visit.